Christmas is already in full swing at Witney market with stalls piled high with festive gifts and produce including cards and gift wrap, fresh fruit and vegetables, flowers and plants, sweets and biscuits, fresh fish, bread and cakes..
As with most other retailers, Christmas is an important time of year for market traders. Carol Reynolds who sells cards and gift wrap is expanding her business and has a new market stall selling toys. She said, "We have all sorts of gifts and toys for children of all ages, such as Advent calendars, Pokemon dolls, Polly Pocket games, novelty pens and beautiful wooden toys. We also have some soft cuddly toys, including penguins, which I think will be very popular this year because of the John Lewis advert." 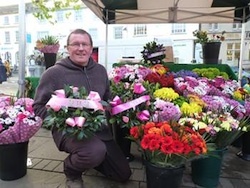 Flower-seller, Andrew Harbon's family has been trading at Witney market for over 30 years. He is taking on an additional pitch to double up his trading space in the run up to Christmas. Mr Harbon (pictured) said, "We see more people at Christmas and we have many regular customers who come to us every year. Holly wreaths are our big seller and we need the extra floor space to display them." Cllr David Harvey, Cabinet Member responsible for markets said, "Witney town centre is thriving and it's especially busy in the lead up to Christmas. On market days, there’s an additional bustle of colour and activity and, along with free parking, they are a real draw, bringing shoppers into town from a wide area."